This summer, Tate Modern will explore the art of the Weimar Republic (1919-33) in a year-long, free display, drawing upon the rich holdings of The George Economou Collection. 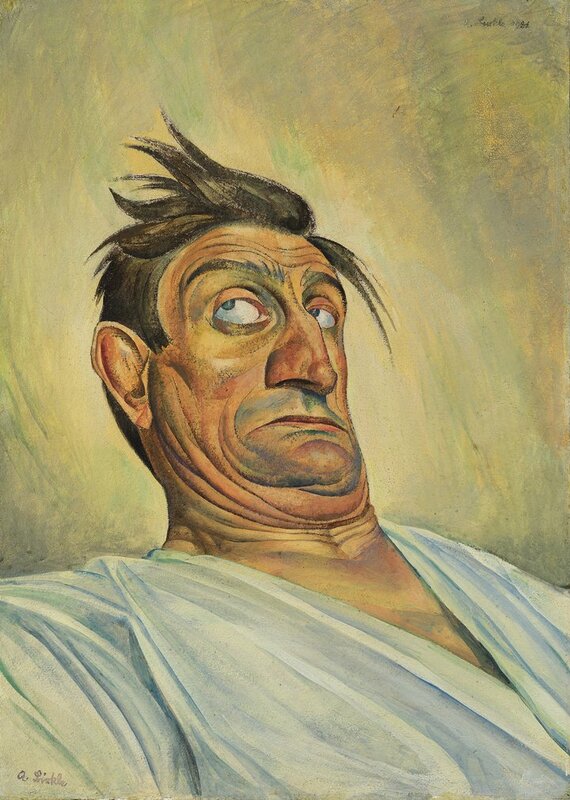 This presentation of around seventy paintings and works on paper will address the complex paradoxes of the Weimar era, in which liberalisation and anti-militarism flourished in tandem with political and economic uncertainty. These loans offer a rare opportunity to view a range of artworks not ordinarily on public display – some of which have never been seen in the United Kingdom before – and to see a selection of key Tate works returned to the context in which they were originally created and exhibited nearly one hundred years ago. 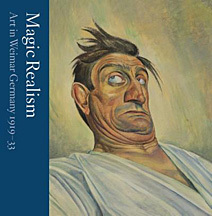 Although the term ‘magic realism’ is today commonly associated with the literature of Latin America, it was inherited from the artist and critic Franz Roh who invented it in 1925 to describe a shift from the anxious and emotional art of the expressionist era, towards the cold veracity and unsettling imagery of this inter-war period. In the context of growing political extremism, this new realism reflected a more liberal society as well as inner worlds of emotion and magic. 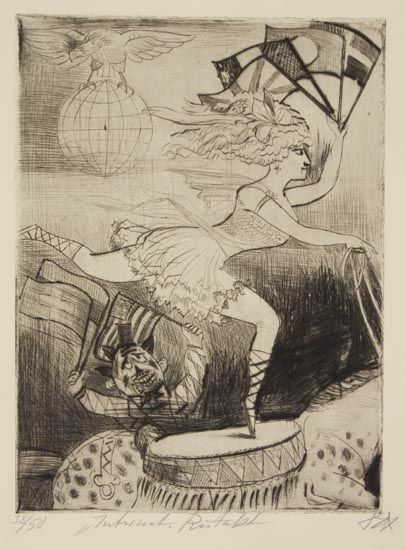 Otto Dix’s enigmatic Zirkus (‘Circus’) print portfolio. Artists recognised the power in representing these realms of public fantasy and places where outsiders were welcomed. 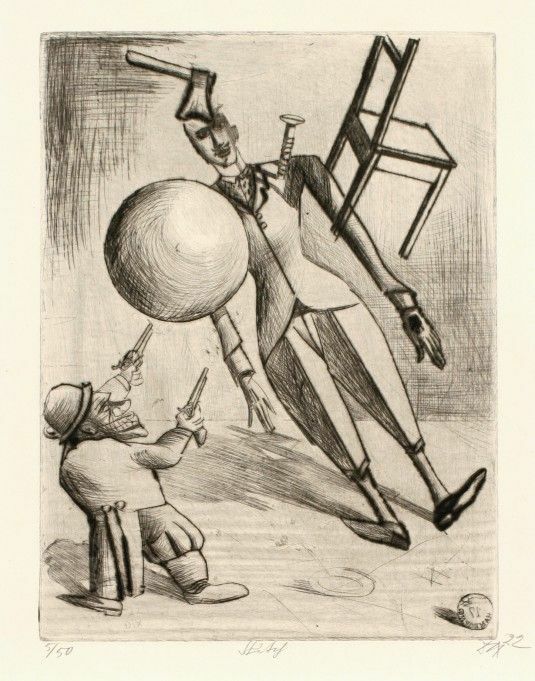 Works by Otto Dix, George Grosz and Max Beckmann perhaps best known today for their unsettling depictions of Weimar life, will be presented alongside the works of under recognised artists such as Albert Birkle, Jeanne Mammen and Rudolf Schlichter, and many others whose careers were curtailed by the end of the Weimar period due to the rise of Nationalist Socialism and its agenda to promote art that celebrated its political ideologies. The display comes at a pertinent time, in a year of commemoration of the anniversary of the end of the First World War, alongside Aftermath: Art in the Wake of World War One at Tate Britain and William Kentridge’s new performance for 14-18 Now at Tate Modern entitled The Head and the Load, running from 11-15 July 2018. Magic Realism is curated by Matthew Gale, Head of Displays and Katy Wan, Assistant Curator, Tate Modern. The display is realised with thanks to loans from The George Economou Collection, with additional support from the Huo Family Foundation (UK) Limited. "Courbet, Degas, Cézanne ... Realistic and impressionist masterpieces from the Burell collection" . For the first time in France, the Musée Cantini presents, from May 18th to September 23rd , the exhibition "Courbet, Degas, Cézanne ... Realistic and impressionist masterpieces from the Burell collection" . The works are from the Burrell Collection, an eclectic collection of art acquired over many years by Sir William Burrell (1861-1958). Sir William Burrell was an exceptional collector of the nineteenth and twentieth centuries with a collection of about 8,000 pieces from all eras and from all continents. In 1944, he offered his entire collection to the city of Glasgow. While some works have sometimes been lent, none have left the UK. The exhibition gathers some sixty works from the second half of the 19th century , compared to the works of the Musée des Beaux-Arts in Marseille . The greatest masters of French painting are present: Courbet , Corot , Daumier , Millet , Fantin-Latour , Daubigny , Pissaro , Boudin , Monticelli , Sisley , Degas , Manet , Cezanne ... This exceptional selection illustrates the evolution of French painting from realism to impressionism . The Girl Looking Through Field Glasses, and then between 1915 and 1926, most of the paintings and drawings of the nineteenth century masters that are found in his collection. and Au café de Manet that the public will discover at the Cantini museum. A Millet's Shepherdess, artists among the most famous of the realist school with Courbet. His collection also contains treasures from the Barbizon School. Landscapes of Corot, Daubigny and the marines of Boudin transport us to the heart of an era while announcing the impressionist school with Manet, Degas and Sisley. All these paintings bear witness to the questions of representation in the second half of the nineteenth century. As such, the works presented by Manet, Degas and Cézanne are masterpieces in direct connection with the twentieth century's modernity. Pablo Picasso’s Femme dans un fauteuil of 1942, will be a leading highlight of Christie’s Impressionist and Modern Art Evening Saleon 20 June 2018. One of a major series of full-scale portraits, painted during the war, Femme dans un fauteuil depicts Picasso’s great muse of the period Dora Maar, the surrealist photographer and painter. Dora brought great colour, beauty and vivacity into Picasso’s life during the difficultperiods of the Spanish Civil War and the German occupation of Paris. Dora Maar’s presence in Picasso’s life,from the moment they met in 1935 until the time their relationship ended around 1945, inspired some of the greatest portraits of the artist’s prolific career. 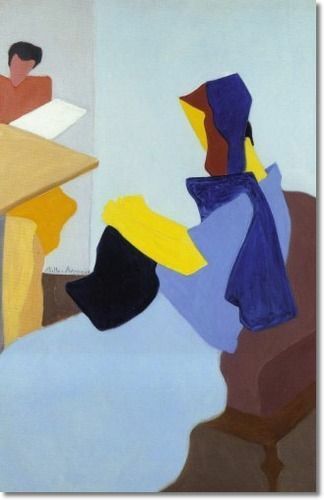 Femme dans un fauteuil remained in the artist’s collection until his death when it passed toJacqueline Picasso and was eventually sold through the agency of Picasso’s dealer, Galerie Louise Leiris in Paris.It is a painting that has been rarely exhibited having remained in the artist’s family for many years. It was first shown in an exhibition of Jacqueline Picasso’s collection in 1986 and has largely disappeared from public view since that time. The painting will be exhibited inHong Kong from 25to 28May and in London from 15to 20June 2018 before its sale on 20 June at Christie’s King Street. Among the most highly worked portraits of Dora that Picasso painted during the Second World War, Femme dans un fauteuil features the iconic distortions which dominated his visions of his raven-haired muse and is notable for its strikingly beautiful colours and the dynamic way in which Picasso has described the sitter’s body. Many of the greatest depictions of Dora of the 1940s share the vibrant colours and dynamism of the present painting and it is perhaps for this reason that it was kept in the Picasso family for so many years.What is most unusual about the work is that it has been so rarely exhibited. 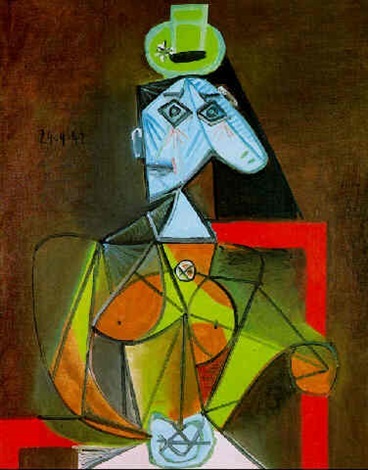 Created in April 1942, Femme dans un fauteuil was executed whilst Picasso wasliving in occupied Paris. Although he had received offers of sanctuary from friends in the United States and Mexico at the outbreak of the conflict, Picasso chose to remain in France, living a quiet life in his studio at 7 rues des Grands-Augustins. Labelled a ‘degenerate’ artist during the Nazi campaign against modern art, the artist’s presence in the city did not go unnoticed by the German forces. While he was allowed to continue to work, Picasso was forbidden from exhibiting any of his art publicly. He remained under close and constant observation by the Gestapo, and his studio was visited on a number of occasions, during which he was questioned as to the whereabouts of friends and former colleagues now in hiding. ‘This superb painting describes Monet at his Impressionist best, capturing in quick, bold brushstrokes the energy of metropolitan Paris as described by the sound and fury of the steam trains as they left the Gare Saint-Lazare,’ says Christie’s Global President Jussi Pylkkänen. 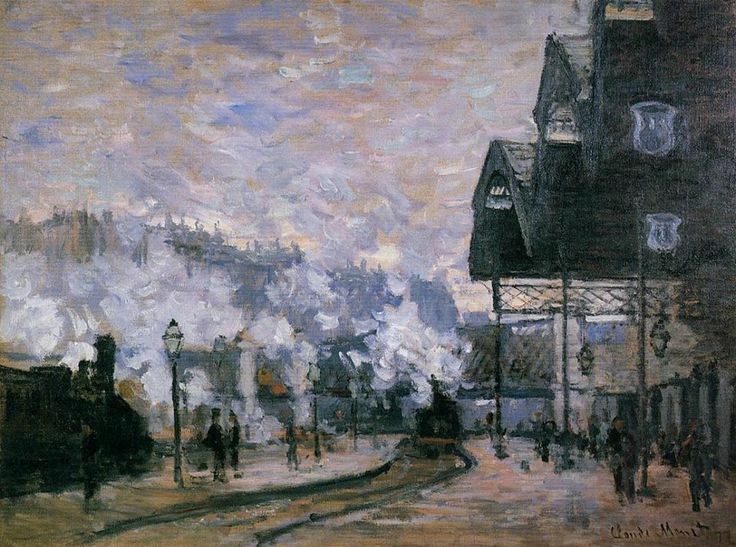 In the Gare Saint-Lazare series Monet depicted the station from a variety of different positions, at different times of day and in different atmospheric conditions — marking the first occasion on which the artist committed himself to the pursuit of a single subject through a sequence of variations. This would come to be one of the defining aspects of Monet’s practice for the rest of his career. In April 1877, Monet included several of the Gare Saint-Lazare canvases in the Third Impressionist Exhibition. Before he executed La Gare Saint-Lazare, Vue extérieure, Monet had been living and working in Argenteuil, just outside Paris. Based in rural Montgeron in the summer of 1876, he returned to the capital in the new year eager to capture the bustling urban landscape. 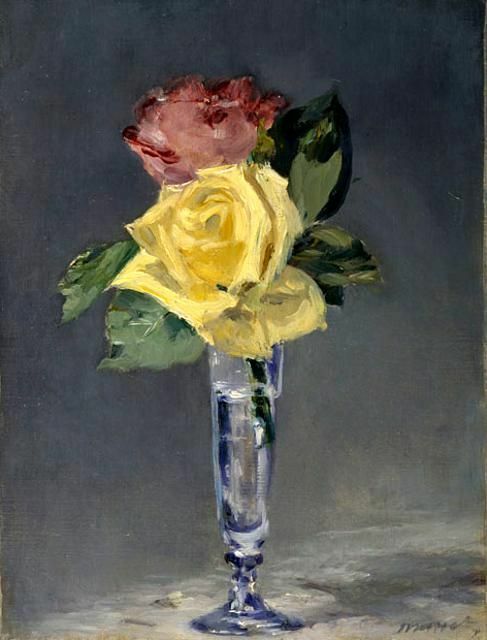 Monet’s friend, the artist Gustave Caillebotte (1848-1894), rented him a small ground-floor apartment near the station; just three months later, the series was complete. Of the 12 Gare Saint-Lazare paintings, today only three remain in private hands. The remaining nine are in public institutions, including the Fogg Museum, Massachussetts; the Art Institute of Chicago; the National Gallery, London; the Musée Marmottan, Paris; and the Musée d’Orsay. Three of these museum works are currently included in Monet & Architecture, a pioneering show at London’s National Gallery which examines the central role architecture played in many of the artist’s compositions. Kazimir Malevich, Landscape, 1911. Gouache on paper laid down on board, 41 3/4 x 41 3/4 in. (106 x 106 cm.). Estimate: £7,000,000-10,000,000. © Christie’s Images Limited 2018. Kazimir Malevich’s Landscape (1911, estimate: £7,000,000-10,000,000) will be a major highlight of Christie’s Impressionist and Modern Art Evening Sale on 20 June 2018, part of ‘20th Century at Christie’s’, a series of auctions taking place from 15 to 21 June 2018. The monumental, square-format landscape is from ‘The Red Series’, a group of works characterised by gestural brush strokes and an expressive use of colour, referencing both Fauvism and Cubism, and anticipating Malevich’s move towards Suprematism. Landscape was first exhibited in the ‘Moscow Salon’ in February / March 1911. It was subsequently shown the following year in St. Petersburg as part of ‘The Union of Youth’, where Malevich represented a radical collective known as ‘Donkey’s Tail’. In 1927, he was invited to Germany to show his work for the first time outside Russia and brought with him the best works of his career to date. 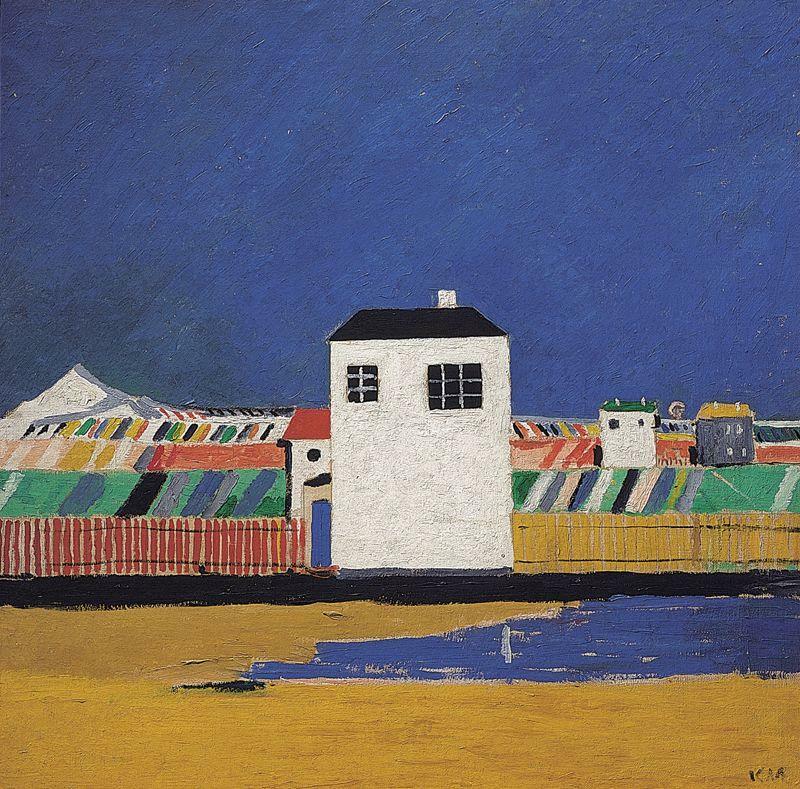 Landscape was one such work and remained in Berlin after Malevich returned to Russia. Due to the rise of totalitarianism in Germany and in his home country, the artist lost control of his works abroad before he died in 1935. Landscape resurfaced after the war and was acquired by the Kunstmuseum Basel, where it hung for over 50 years, before being restituted to the heirs of the artist. 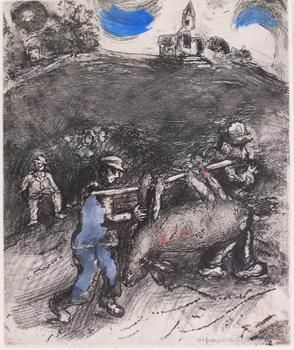 It is now being offered from a private collection and represents the first time that work has come to auction in two generations. Landscape will be exhibited in London from 15 to 20 June 2018. Landscape is a ‘pure’ landscape painting whose motif of peasant dwellings surrounded by stylized treetops is borrowed from Russian primitive art. The use of colour to sculpt the forms represented recalls the techniques employed by Cézanne, while the block-like depiction of the buildings nods towards the Cubist compositions of Braque and Picasso. By distilling these diverse visual references, Malevich has created a powerful and profoundly unique work of art. He himself stated that ‘one was obliged to move both along the line of primitive treatment of phenomena, and along the line of Cézanne to cubism.’ The red-hot gleam on the horizon is a direct depiction of the sun, one of the unique features of the painting that foretells the primacy of colour that would define Suprematism. and Red House, all of which are in the collection of the State Russian Museum. The exhibition presents a spectacular selection of eighteenth-century Venetian art, with Canaletto's greatest works shown alongside paintings and works on paper by Sebastiano and Marco Ricci, Francesco Zuccarelli, Rosalba Carriera, Pietro Longhi and Giovanni Battista Piazzetta. The exhibition explores the many delights of eighteenth-century Venice, from the splendours of the Grand Canal and St Mark's Square to its festivals, theatre and masked carnival, bringing the irresistible allure of the most beautiful city in the world to The Queen's Gallery. The Royal Collection contains the world's finest group of paintings, drawings and prints by Venice's most famous view-painter, Canaletto (1697-1768). These works were bought by the young George III in 1762 from Canaletto's agent and dealer Joseph Smith, British Consul in Venice, along with the rest of Smith's huge collection. Smith first met Canaletto in the early 1720s, and quickly spotted his potential. Their relationship developed into an unofficial partnership of mutual benefit, and a friendship that was to last for over 40 years. Canaletto’s paintings of Venetian views found a lucrative market among the British Grand Tourists in Venice who wanted paintings of the city to take back to Britain as souvenirs. Smith acted as Canaletto’s agent, liaising between artist and patron, handling payments and shipping works to Britain. 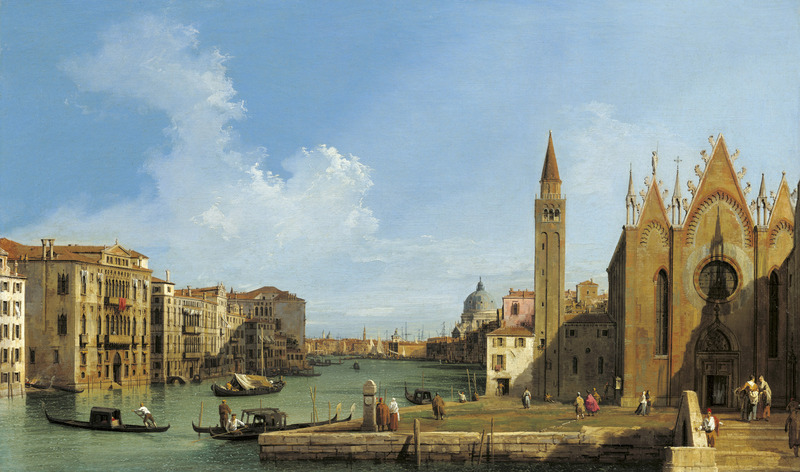 At the same time Smith commissioned many paintings from Canaletto for his own collection, such as the series of 12 paintings of the Grand Canal that promoted his work to the many visitors Smith received in his palazzo. Smith also supported Canaletto in more difficult times: in the 1740s the War of the Austrian Succession disrupted the steady stream of visitors to Venice, and as the artist’s workload declined, Smith commissioned a series of monumental views of Rome and a set of overdoor paintings. In 1746 Smith arranged for Canaletto to travel to Britain, where he stayed for almost ten years. By 1762, when his collection was sold to George III, Joseph Smith had amassed the greatest collection in existence of paintings and drawings by Canaletto. Through over 200 paintings, drawings and prints from the Royal Collection's exceptional holdings, Canaletto & the Art of Venice presents the work of Venice's most famous view-painter alongside that of his contemporaries, including Sebastiano and Marco Ricci, Rosalba Carriera, Francesco Zuccarelli, Giovanni Battista Piazzetta and Pietro Longhi, and explores how they captured the essence and allure of Venice for their 18th-century audience, as they still do today. Alongside the grand public entertainments, Venice boasted a thriving opera and theatre scene, especially during carnival season. The need to create stage sets within a very short period of time provided plentiful employment for Venetian artists. Both Marco Ricci and Canaletto worked for the theatre, where they learned how to manipulate perspective to heighten drama. The exhibition includes several of Ricci's designs for the Venetian stage, such as A room with a balcony supported by Atlantes, c.1726. Marco Ricci also produced caricatures of opera singers, such as the drawing of the internationally famed castrato Farinelli, which were circulated among Joseph Smith and his fellow Venetian collectors and opera aficionados. Canaletto, Marco Ricci and Francesco Zuccarelli all contributed to the development of the genre known as the capriccio – scenes combining real and imaginary architecture, often set in an invented landscape, to create poetically evocative works. The ruins of ancient Rome in both Ricci's Caprice View with Roman Ruins, c.1729, and Zuccarelli's pastoral scene Landscape with Classical Ruins, Cattle and Figures, c.1741–2, convey a sense of the irrevocable loss of a great age. There was a major revival in printmaking in Venice in the 18th century, with many publishers recruiting established artists, such as Giovanni Battista Piazzetta and Antonio Visentini, to provide designs for their publications. Joseph Smith was an enthusiastic print collector and one of the major supporters of contemporary printmaking in Venice. Smith financed and directed the Pasquali press, which contributed to the circulation of Enlightenment ideas, such as those of Isaac Newton, and imported banned foreign texts into Venice, including the work of Voltaire. Visentini was the chief draughtsman for the press, providing many hundreds of pen and ink drawings of initials and tailpieces, several of which will be on display in the exhibition. Canaletto, The Mouth of the Grand Canal looking West towards the Carita, c.1729-30 (detail) from a set of 12 paintings of the Grand Canal. Unseen on the market for 60 years, this remarkable depiction of a Venetian Nobleman was almost certainly cherished by the artist who kept it until his death in 1640. A cquired by the great Dutch co llector Hans Wetzlar in the early 1950s , it has remained in the possession of his descendants ever since . One of only a few portraits by the artist to come on the market in recent years , it is estimated in the region of £3 million. Painted in the 1620s, at the height of Rubens’ career, the work depicts an imposing and evidently po werful man in the prime of life fixing the viewer in his penetrating gaze. Although Rubens almost certainly based this study on a Venetian prototype, quite probably by Tintoretto, his subject is largely the product of his own immensely creative imagination . Far away from Tintoretto’s portrayals of men who almost seem to be wilfully obscure, the work is testament to Rubens’ idea of a forceful Italian nobleman, a Renaissance man who is accustomed to power and leadership. As in his best pictures , the Flemish Master has imbued this portrait with much of his own personality. While not a self - portrait, it is a study of a man in whom Rubens recognises himself – another successful man of his own times, and perhaps too, like Rubens, something of a polymath. Painter, designer , print - maker, sculptor, architect , diplomat, peace - treaty broker, at the helm of the largest studio of his time, Rubens was the first great artist - collector in Northern Europe and the fact that he almost certainly owned the present portrait until his death is testament to its importance. This work also reflects Rubens’ love of Italy, which once discovered, remained an essential part of his artistic and cultural influence. During his eight years in Italy, be tween 1600 and 1608, the artist, then in his twenties, worked for important patrons, including the Duke of Mantua. In Venice he found inspiration in the work of his predecessors Titian, Veronese and Tintoretto. In Rome, the art of classical Antiquity made a great impression on him. He studied it avid ly, creating a number of drawings, which he would regularly go back to later in his career. In Rome, he also experienced the direct influence of his contemporary, Caravaggio. However closely he is identified with Flemish art, Rubens never ceased to be in part an Italian artist, as this exceptional portrait shows us. This summer, Sotheby’s will offer for sale a selection of works from the collection of esteemed connoisseur and benefactor, the late Baron Willem van Dedem (1929–2015), as part of its flagship Old Master sales (4–5 July). 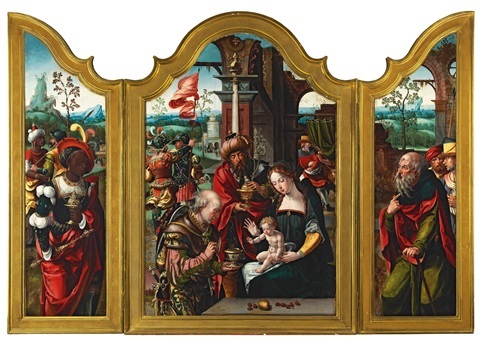 A testament to Baron van Dedem’s exceptional taste and eye for quality, the group of works to be offered features outstanding examples by leading Dutch and Flemish masters, including Balthasar van der Ast, Jacobus Vrel, Peter Paul Rubens and the brothers Jan Brueghel the Elder and Pieter Brueghel the Younger. A successful businessman and a philanthropist, Baron van Dedem was a passionate collector and connoisseur of Dutch and Flemish Old Master painting. Visiting the Delft art fair for the first time in 1957, he made his first artistic purchase six years later, eventually assembling what would become one of the finest private collections of Dutch and Flemish 17th Century paintings in Europe of his time. Refined and improved over many years, the collection encompassed all the specialisms of Dutch and Flemish art, including history and genre painting, portraiture, still life, landscape and seascapes, offering a comprehensive overview of paintings from the Golden Age. As President of the Board of The European Fine Art Fair (TEFAF) at Maastricht from 1997 until his death in 2015, Baron van Dedem played an active role in the art world and was well known as a generous benefactor. Committed to strengthening the holdings of Dutch public collections, he donated and bequeathed numerous masterpieces to major national institutions, namely the Rijksmuseum in Amsterdam, and The National Gallery in London, in order to share his passion for 16th and 17th century painting as widely as possible. Works by David Teniers the Younger, Jan van Kessel the Elder and Adriaen Coorte gifted by the Baron to The National Gallery in London were recently put on public display. 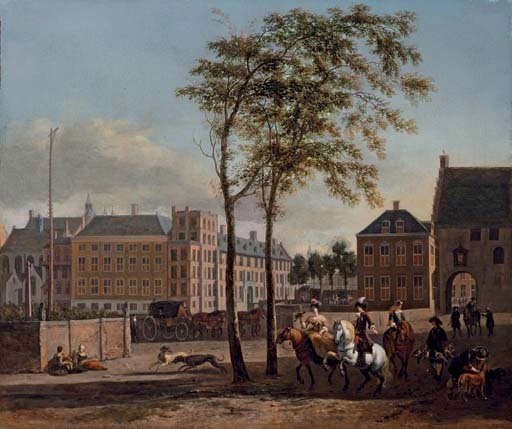 The Mauritshuis in The Hague earlier received a significant gift of paintings from Baron van Dedem, including still lifes by Pieter Claesz and Willem Kalf, landscapes by Frans Post and Salomon van Ruysdael, and a scene of dancing peasants by Roelant Savery. Sotheby’s spring auction of American Art will be held in New York on 23 May 2018. Sotheby’s spring auction of American Art will be held in New York on 23 May 2018. 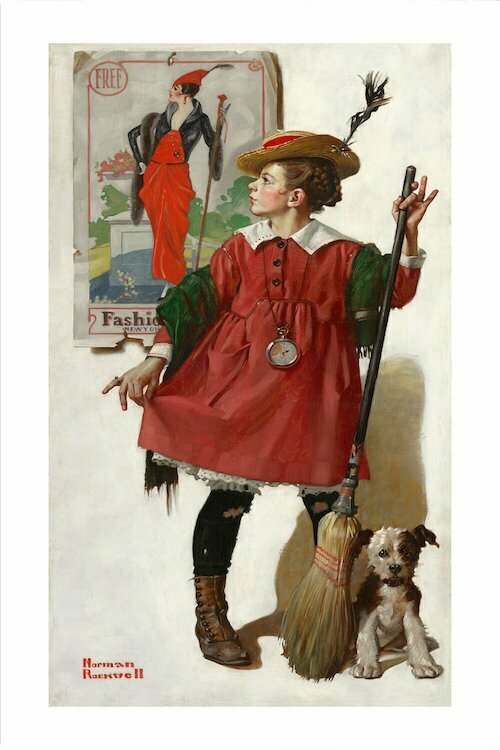 Led by 13worksby Norman Rockwell from all periods of the artist’s decades-long career, the sale features 120+ lots that are together estimated at more than $40million. 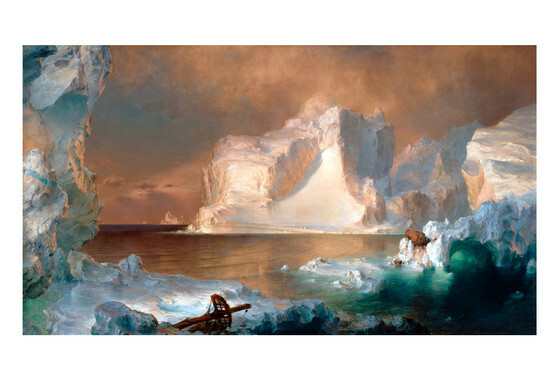 The auction also includes exceptional example by Frederic Edwin Church, N.C. Wyeth, Milton Avery, Albert Bierstadt and Thomas Moran– many of which are from distinguished private collections and are coming to auction for the very first time. The drama of the competition is palpable as the two men captivate the growing crowd with their strength and skill. Working from photography and his own imagination, Rockwell exactingly depicts 23 figures in this impressive composition, including a self-portrait and two different representations of one of his favorite models, Harvey McKee –the undersheriff of the town of Arlington, Vermont. Another exceptional example by Norman Rockwell is The Little Model from 1919(estimate $1/1.5 million). A gift from the artist to his aunt that has remained in the family collection for nearly a century, the work was completed for the 29 March 1919 cover of Collier’s, making it one of Rockwell’s earliest images executed on commission for a prominent American publication. Rendered in the artist’s early style and technique, The Little Model brilliantly captures a young girl’s wistfulness and longing to transform into a beautiful adult, a detail highlighted when it appeared on Antiques Road Show in 2011. Rockwell’s Boy Playing Flute Surrounded by Animals (Springtime) is another major highlight of the auction, carrying an estimate of $1.5/2.5 million. Appearing on the 16 April 1927 cover of The Saturday Evening Post, the painting captures the artist’s pivotal transition from his early aesthetic to his most iconic style; the white background evokes his earlier vignette-style format while the near-photographic likeness of the animated animals dancing around the young boy’s feet foreshadows his mature works. Spirited and cheerful, the painting comes to auction for the first time from the collection of Jack and Bonita Granville Wrather – he the producer of television series such as The Lone Ranger and Lassie, she the Hollywood actress who brought Nancy Drew to life. 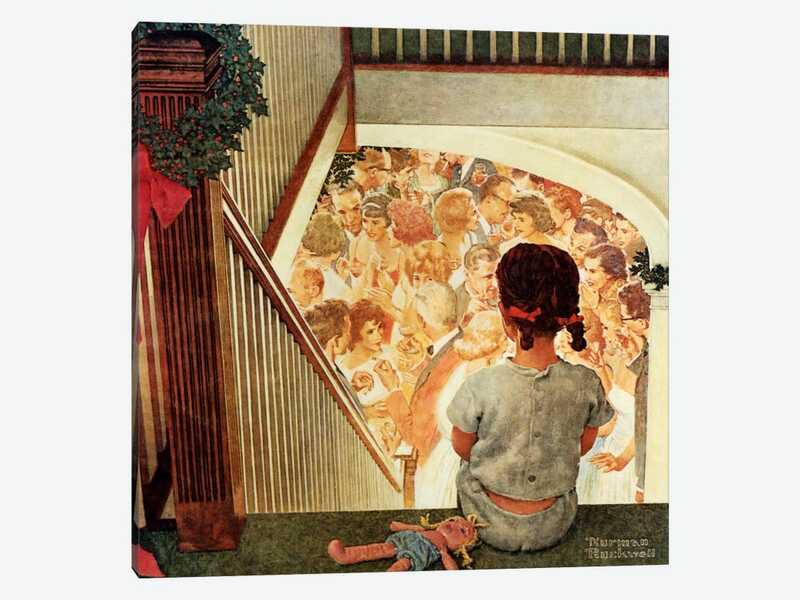 Nearly forty years after the completion of Springtime comes Little Girl Looking Downstairs at Christmas Party, one of Rockwell’s most recognizable images. Painted for the cover of the December 1964 issue of McCall’s, the work depicts a forlorn young girl looking from the top of the stairs at the merry cocktail party taking place downstairs that she cannot join. A gift from the artist and being offered for the first time, this beloved image will be presented with a pre-sale estimate of $1/1.5 million. Also appearing at auction for the very first time is N.C. Wyeth’s Portrait of a Farmer (Pennsylvania Farmer) from 1943, which was formerly in the collection of the artist’s wife. 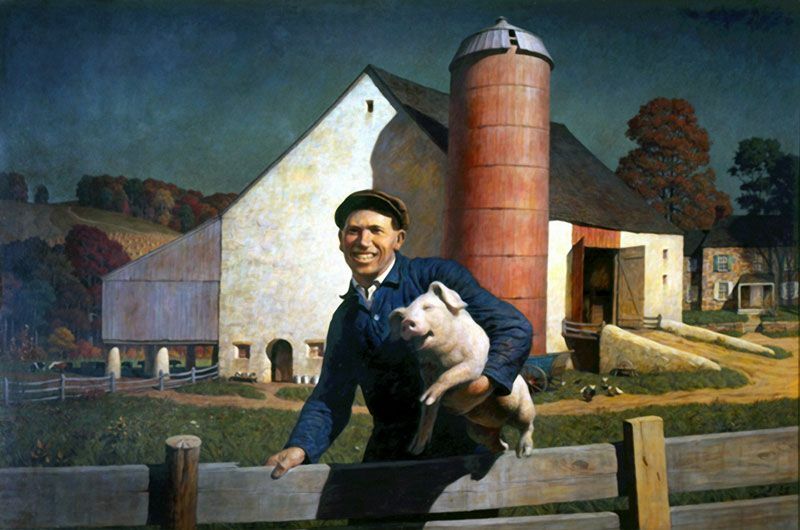 Wyeth created this striking portrait by synthesizing his memories and experiences of his Pennsylvania home: the architectural elements are common to the Chadds Ford area,while the subject is based upon a local farmer whom Wyeth encountered carrying a pig under his arm.The artist discussed Portrait of a Farmer in a 21 January 1943 letter to his daughter Henriette, writing: “In spite of all, my present large panel of the squealing pig is vastly superior to anything to date.” In keeping with the true quality of this work, the painting will be offered this May with an estimate of $2.5/3.5 million. held by the Metropolitan Museum of Art and the Dallas Museum of Art respectively, the work is one of Church’s final paintings. View of Nassau, The Bahamas (estimate $700/1,000,000). One of a small series of works inspired by his visits to this tropical paradise– a location also frequented by American artists including Louis Comfort Tiffany and Winslow Homer– in the mid-1870s and through the early 1890s, the work is distinguished by its impressive scale, vivid hues, saturated sunlight and attention to architectural detail. A Showery Day, Grand Canyon by Thomas Moran is another significant landscape by a major 19thcentury artist presented in the May sale. The painting depicts the terracotta peaks of the canyon shrouded in silvery clouds, capturing the majesty of one of the Unites States’ greatest natural treasures. Offered by a private American collection with a pre-sale estimate of $800/1.2 million, the work last appeared at auction nearly twenty years ago at Sotheby’s New York. 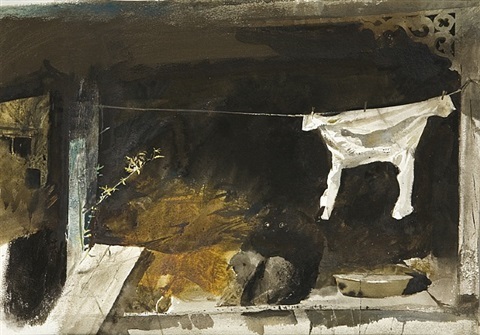 Andrew Wyeth’s1964 watercolor The Bachelor. 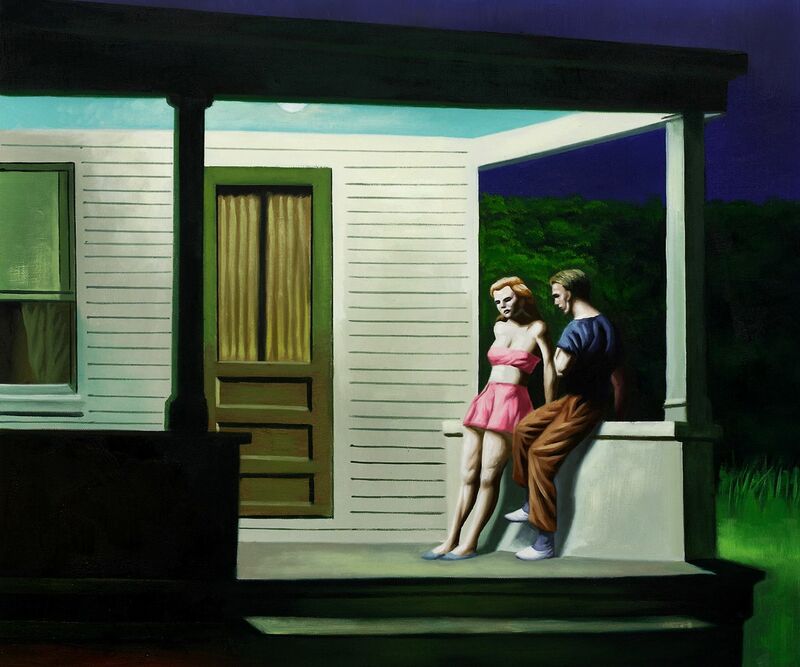 American realism is represented by two Edward Hopper drawings from the collection of Steve Martin. 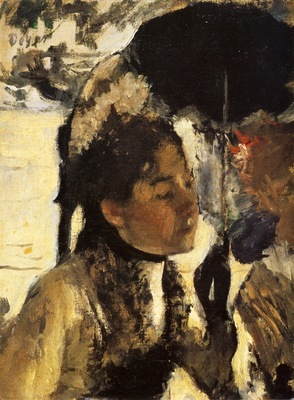 the painting of the same name in the collection of The Whitney Museum of American Art, New York. a major oil painting of the same title, which carries an estimate of $200/300,000. The Western Art offerings this season are highlighted by works by Charles Marion Russell, Frederic Remington and Olaf Carl Seltzer from the Jack and Bonita Granville Wrather Collection. Russell’s When Guns were the Locks of the Treasure Box is a spectacular watercolor, gouache and pencil on paper that conveys the sense of excitement and adventure that the American West inspired (estimate $150/250,000). Frederic Remington’s Western Stage Managers is also a noteworthy addition from the Wrather Collection. A striking scene with a pre-sale estimate of $60/80,000, this work has been exhibited extensively across the Midwest, including the Minneapolis Institute of Arts and the Sterling and Francine Clark Art Institute in Williamstown, Massachusetts.